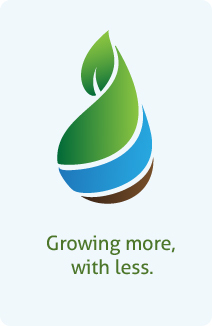 WaterGrip™ – the revolutionary growing media designed to grow thriving plants while conserving precious resources. Able to hold 8x its weight in water, WaterGrip uniquely provides roots with a ready supply of air, nutrients, and most importantly, water. Roots and plants are healthier and more robust with less water, time, labor, fertilizer, and energy. WaterGrip…it’s about growing more, with less. WaterGrip Growing Media is a patented, breakthrough growing technology that delivers outstanding growing results while enabling enhanced water management and reduced overall water usage. WaterGrip can take on more water, hold onto more water, while also providing roots with the air and nutrients they need. Whether you are planting an urban rooftop, a living wall, in a pot or in the ground, chances are your business depends in part upon efficient water management. WaterGrip Growing Media was designed to help you grow and maintain the healthiest of plants in a variety of places with conserving water and other precious resources. EZ Care Growing Technologies is a Massachusetts based enterprise bringing revolutionary WaterGrip Growing Media products to the green products marketplace. We recognize clean water as a precious resource and feel the time is now to grow plants more responsibly – with water conservation at the top of the list.